Old man mountain was preparing something special for us behind that curtain of white. I could feel it as we hiked in a cloud of fog, his handiwork hidden from view. We climbed narrow steps chiseled into a boulder, following a paved trail through a forest of aged, weathered pine. The color of wild flowers popped through the fog: a pink nettle weed, a cluster of orange tiger lily blossoms, tiny pink bell flowers. Dew-coated spider webs glistened. Silence, but for an invisible stream flowing somewhere far below. A dark green pine branch swayed in the gentle breeze. Speckles of mist collected on a needle, falling as a single raindrop. A bird chattered to an unseen friend, who mimicked a return call. The dank smell of wet bark, wet ferns, wet moss permeated the air. Patterns of mist shifted with the air currents. Nature was moving at its own pace. We were assured that was shrouded in cloud would change in due time. We sat on a stone wall at the peak, staring into the white nothing. Patience. It was time for the sun to set. A breeze gathered strength, pushing fog tendrils up and over the cliff ridge. A few silent minutes passed. We stared at the sea of white and began to notice a thinning; a patch of pale light. The distinct outline of a large cumulus cloud began to take shape on the blank canvas of white. The thinning patch turned baby blue. Warm air currents gathered mist into jumbles of fast moving fog, pushing masses of grey from mountain tops. We had waited all day for Old Man Mountain’s big reveal. He did not disappoint. It felt magical. 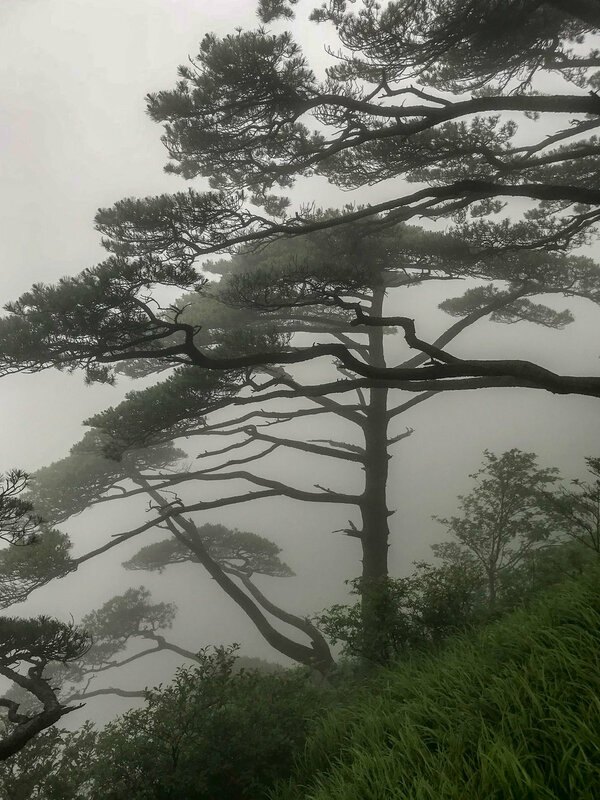 This is Huangshan. This is zen. 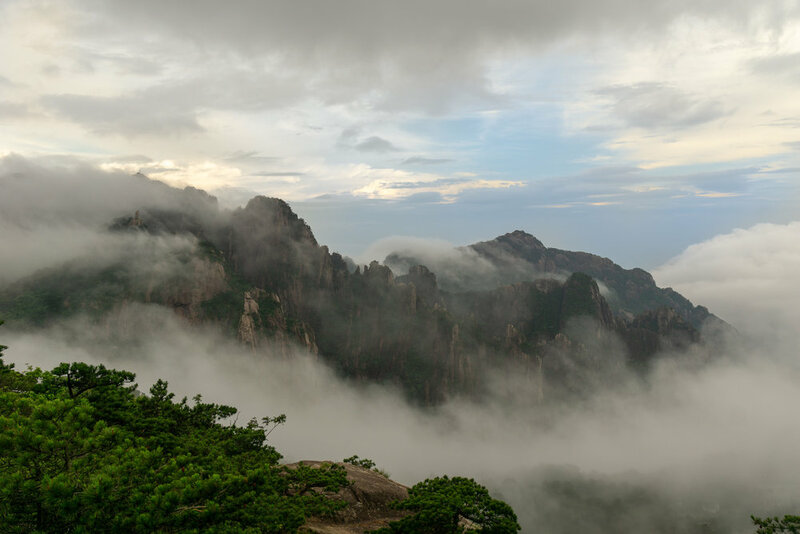 Want to see a time lapse of the cloud movement at Huangshan? We posted a short video on our Travel Is Zen YouTube page. Like this post? Please love, share, pin, or leave us comment. We enjoy connecting with other travelers. Hope to see you on the road!